So what if you don’t keep your New Year’s resolutions! Making my New Year’s resolutions is a yearly ritual. Thanks in large part to my dad, I have sat down every year since I was a kid to make my resolutions. For the past few years, I’ve called them “Envisioned,” instead of resolutions. For example, last year was “2011 Envisioned.” The simple act of calling my resolutions “Envisioned” has helped me to refocus my intentions on what I want my year to look like instead of how I want to change myself. Of course, those traditional little resolutions related to change still sneak themselves in there, but the big goal of sitting down and looking forward is to actually ask myself what I want in life. That’s a pretty exciting and important question! 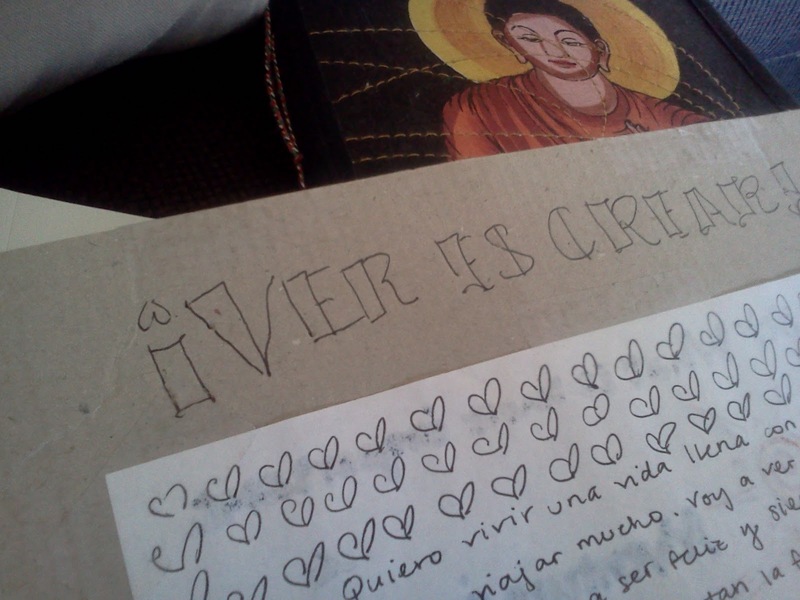 Last week, I dug up my resolutions for the past few years and reread them. Even though I may not have successfully given up sugar or gone to the gym religiously, it was really exciting to be able to look back five years and see that overall I’ve moved my life in a direction that I already foresaw back then. It’s strange to revisit your past self and realize that you really are the same person! That may sound odd, but a lot of times, I think we see our current self as so different and evolved from our previous versions, when really, we are our past, present, and future self simultaneously. Okay, okay, I’m getting a little metaphysical, I know, but this is a concept that fascinates me. At any rate, going through my previous resolutions reminded me that I really am, to some degree, controlling my destiny through envisioning what I want my life to look like each year. I also noticed that I break my goals into common themes each year, whether I made my resolutions in a journal, as a collage, or on a gigantic piece of watercolor canvas. These themes include: Health, Family, Finance, Career, and (Intentional) Joy. Even the goals that changed because life changed are interesting to go back and reread. 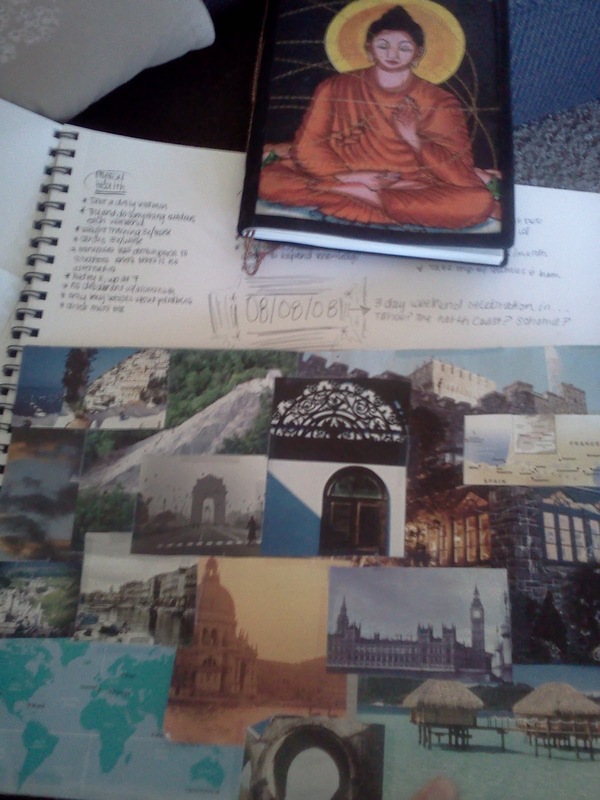 Remembering these changes reminds me of different points in my life that I may have forgotten without these road maps. Most exciting, is seeing the goals that are many years old finally coming to fruition, (finding a job I like, writing a book, traveling, etc.). I think that New Year’s Day is becoming one of my favorite holidays as an adult! 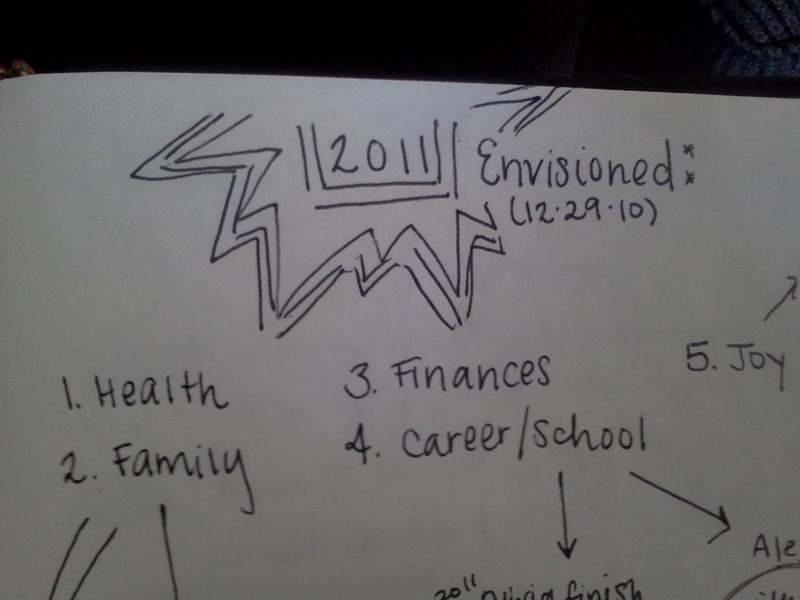 I am genuinely excited to sit down today and envision 2012. If you have made it through my rambling thoughts above, I invite you to join me today in envisioning your life in 2012. Stop worrying about whether you’ll keep your resolutions and just make them. What do you want your life to look like this year? What do you need to do to make this happen? Dream big, you might surprise yourself. Over the years, my resolutions have taken on a variety of different mediums. Regardless of the medium, I have always broken up my resolutions into categories. 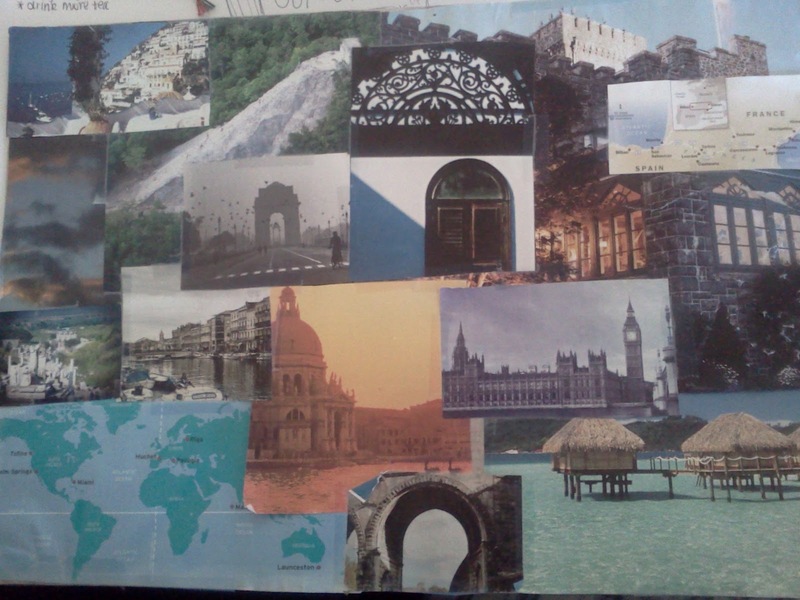 This was one of my favorite years to look back at; I made it during college and through my travels since then I have always thought back to this collage and spotted the scenes that mimic what I envisioned. The most memorable was when Alex and I moved to Berkeley and found an old church up the hill from our apartment that looked exactly like the picture third down from the upper right-hand corner. I believe that we do create at least some of our reality, so use this time to create one that you’re excited about! As always you both inspire and impress me. I like your idea of doing a collage rather than a list. How fun! You are so inspiring my friend!